Before erecting bird houses one should first determine the kind of birds to which his premises are adapted. The question usually next arising is as to the number of birds that can be accommodated. Unless grounds are large, it is generally useless to expect as tenantts more than a pair of each species, except martins. However, the singular intolerance shown by most birds during the breeding season to others of their kind does not operate between those of different species. A dozen different kinds of birds will pursue their several modes of hunting and raise their families on the same lot, but rarely two of the same sort. Of all our house birds, martins alone are social. The fact that birds are more tolerant toward strangers than toward relatives was well illustrated by an observation made recently by the writer in New Mexico. A one-story tool house 10 feet square had nailed to three corners of its roof rough birdhouses made from packing boxes. One was occupied by violet-green swallows, another by western bluebirds, and the third by English sparrows. 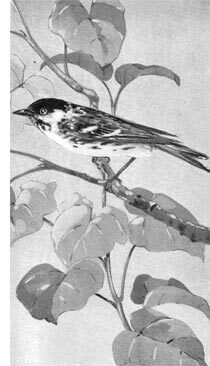 A still more remarkable association of different species has been reported by Otto Widmann, of St. Louis, Mo., who once had in one house a pair each of flickers, martins; house wrens, and English sparrows nesting simultaneously. The fact that there is a limit to the possible bird population on any given tract must be taken into consideration. When the probable tenants have been decided upon, the selection of sites is in order, for the site often decides the style of house that is to occupy it. In the final placing of bird houses, care should be taken to have them face away from the winds prevailing in stormy weather. The strongly developed homing instincts of birds can be relied on to attach them to the neighborhood where they first saw the light, and the identical pairs which nest in the houses provided for them one year will often return the next season to enjoy the same bounty and protection. One can buy a nice bird house kit in a specialized store, or use a bird house design plan supplied by this website to make your own unique bird house.